Katalyst believes that exposure to inspiring leaders who have gone through the trials and tribulations to achieve their goals would motivate the Katalysts to relentlessly work towards their own personal and professional goals. Hence, every year Katalyst organises a national convention in Goa, where Katalysts from all the centers get an opportunity to interact with each other, with leaders from the industry who are invited for the panel discussion and with the mentors and supporters who attend the convention. 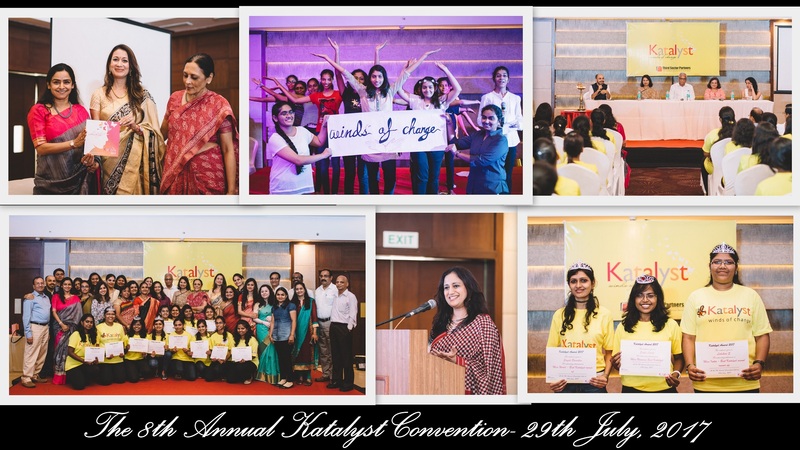 Katalyst’s 8th Annual Convention was held on 29th July 2017 in Country Inn and Suites, Goa, amidst room filled with 170 bright young women in bright yellow t-shirts eager to absorb all that panelists had to offer, eager to learn and be more empowered! All these young women from some of the most challenging socio-economic circumstances had the desire and ambition to achieve personally, academically and professionally. Katalyst also launched its Yearbook, Winds of Change 2017 at the convention and handed out prestigious Katalyst Awards to high performing Katalysts.